Trolls have long troubled the thoughts of humanity and dwarf-kind. Sages remain baffled at the origins of these creatures and the driving force behind their unnatural vitality and strength. 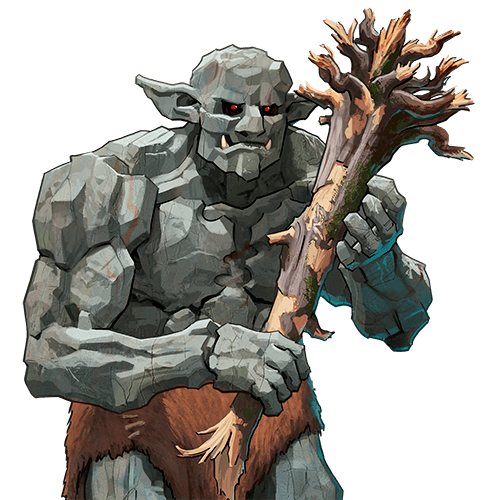 A fully-grown troll towers above a man, and, even unarmed, would be a great threat in combat. The large clubs typically favored in fighting act as extensions of their arms, used for the same purpose of mauling their prey into submission. Nota bene: This unit regenerates, which allows it to heal as though always stationed in a village. Last updated on Sat Apr 20 00:48:43 2019.